This sophisticated and classic Christmas Tree Embroidered Stocking is certain to look stunning hanging from your mantle or wall. This Embroidered Christmas Stocking is beautifully stiched in red thread and accented with a glistening Christmas tree and presents. Your Embroidered Christmas Tree Stocking is Velvet with Metallic Trim, along with appliqué and metallic embroidery, measure 18.5" long with a festive Christmas Tree design. 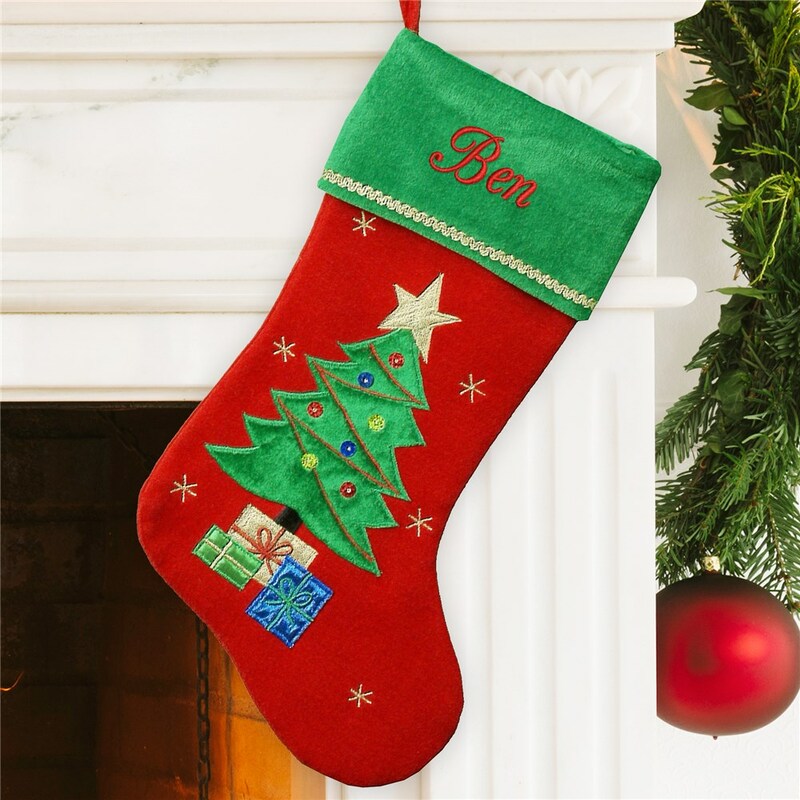 Personalize your Christmas Tree Stocking with any name in red lettering. Will look good on mantle this year! These are very cute with bright colors and perfect as expected as this is not the first time purchasing from this seller. Additional Details GiftsForYouNow is the leader in Personalized Christmas Gifts for the entire family. We have a vast selection of Unique Christmas Gifts sure to make this holiday one the entire family will remember for a lifetime. Shop GiftsForYouNow and enjoy FREE personalization along with very affordable prices on every Christmas gift. Check out this personalized stocking for dogs or this cool photo stocking for Christmas! Shop GiftsForYouNow for personalized Christmas Stockings in time for the holidays.